As I was cutting back the bushes and flowers that remained in the garden, I realized that there was still a lot of beauty to some of what I was discarding. There were mums vibrant and thriving. Hosta leaves were green. 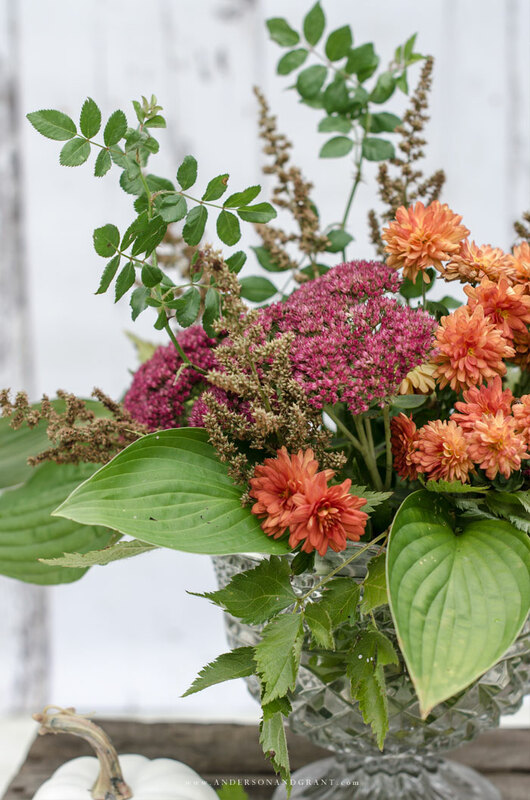 And even though the astilbe bush had lost it's light purple flowers, what was left of the flower was very "fall" appropriate and beautiful in it's own way. 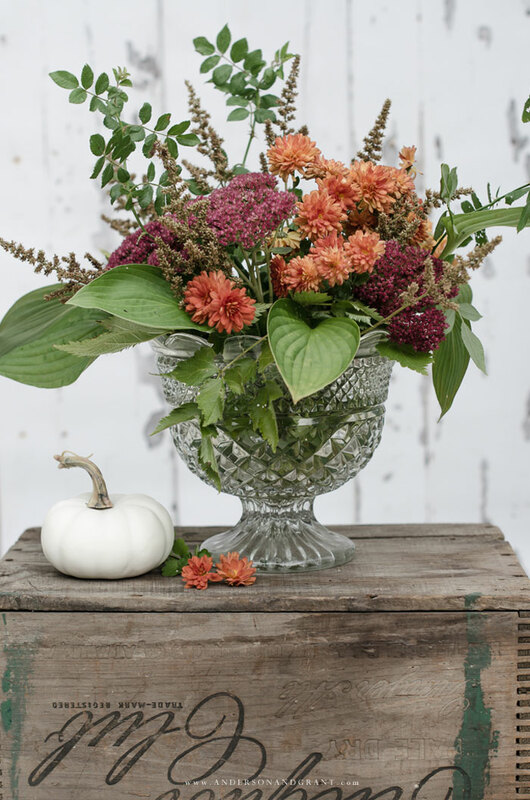 It is always nice to have fresh flowers in the house and I thought that what I was seeing here would make a lovely fall arrangement for the dining room table. 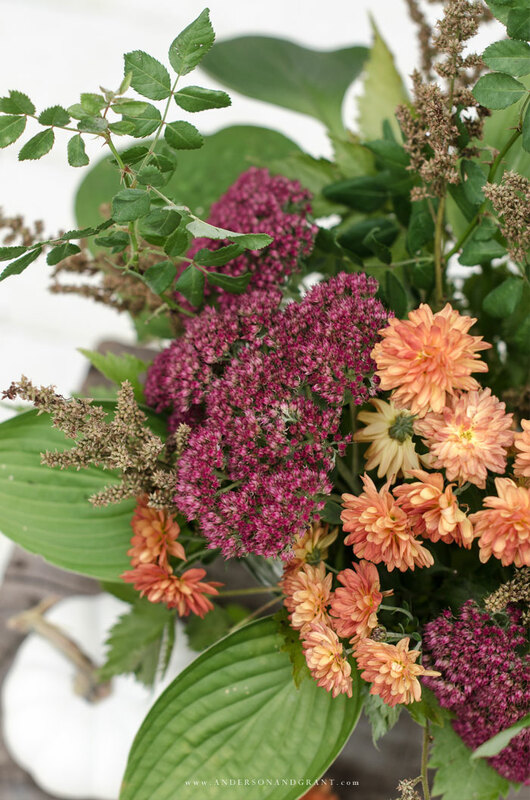 In addition to the orange mums, hosta leaves, and astilbe flowers, I trimmed a few pieces of a rose bush and tucked in some Autumn Joy sedem, one of the prettiest fall flowers, in my opinion. There is nothing fussy about this flower arrangement. I layered the hosta leaves along the outer edges of the vase and then literally just stuffed in whatever I had gathered. I like to leave some flowers sticking out more than others, as well as letting some leaves drape down over the sides of the container I'm using. 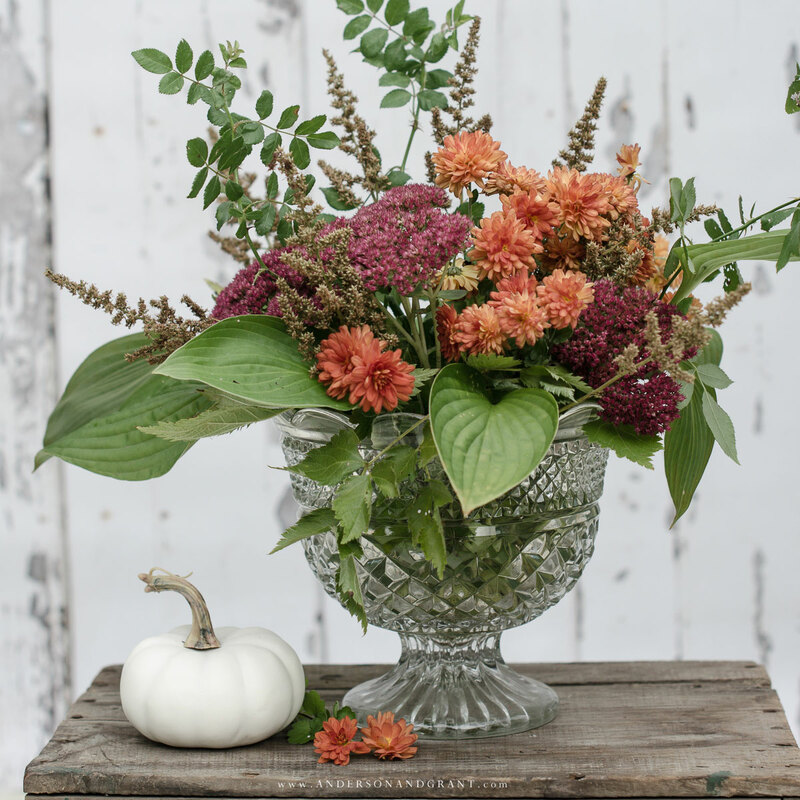 I've shared a few flower arranging tips here before and am a fan of not overthinking how you put them together. Use what you have. And place the flowers where and how they feel correct to you. 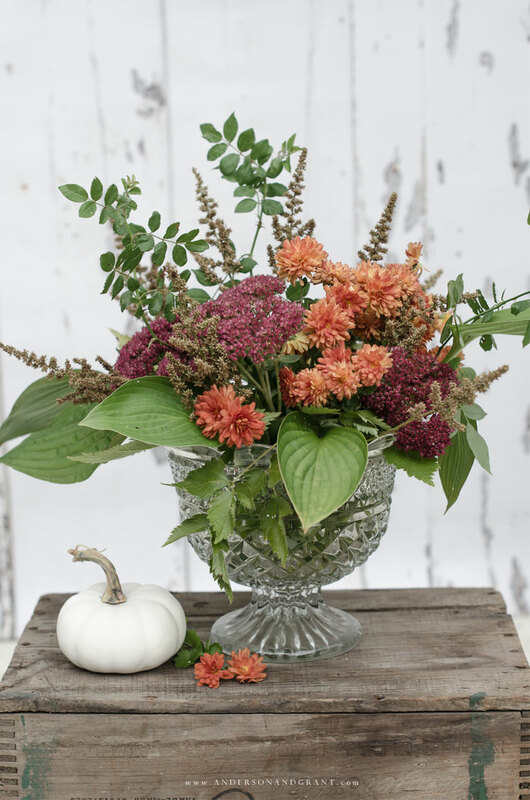 There is no right or wrong way to create an arrangement whether you are buying flowers from a florist, cutting them from your own backyard, or in this case, trimming things back for the fall. This is something that you can do with whatever types of plants and shrubs you have left still growing outside. Mix and match different colors. Cut branches with leaves from the trees in your yard. Add in something that seems a little odd like the astilbe that will add some texture and "architecture". I think the leaves and spent flowers of a butterfly bush are equally as pretty in the fall. This is all garden debris that was just going to be thrown away but it still had enough life to enjoy it a bit longer indoors....and it added a nice fresh flower fragrance to the house as well. Think outside of the box and find ways to incorporate the beauty that you see around you into your life, my friends!